I recently installed a LaView camera system for some great clients of mine and what a nightmare it was. We went with a 6 camera 4k system that had decent reviews on Amazon. The physical install of cameras and recording system went very smooth and all equipment was mounted, installed, and connected in around 4 hours. I then turned to what should have been the easy part… configuring the recorder and setting up remote viewing. First I tried quite a few LaView apps in the Google Play Store and connecting while on the same local network. 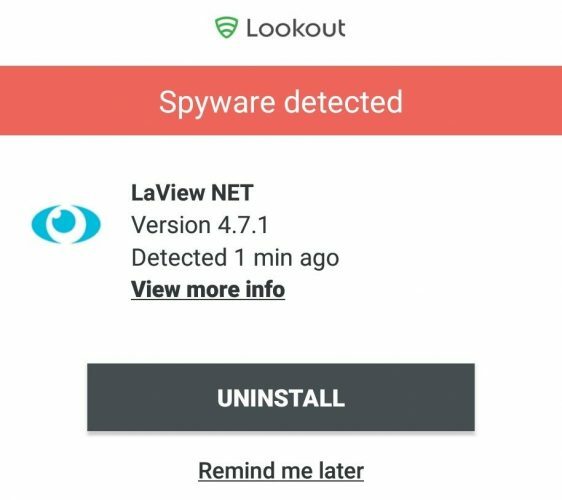 The app that finally worked was “LaView NET”. I was finally able to get connected after more issues and begin to test the remote functionality. Now I need to set it up so that my clients can remotely view their cameras while they are away from home. It is advertised as a simple P2P solution that is as simple as scanning a QR code and getting connected. Would you guess that didn’t work either? After having no luck with their “P2P” system I finally configured dynamic DNS and forwarded ports to their recorder and was able to successfully connect remotely. While not being pleased with the interface and overall functionality it was somewhat usable although it was not fun. Fast forward to this morning while I was going through notifications and found this frightening alert from Lookout which is my mobile anti-virus. Essentially what it says is that the makers of the app have the ability to forward a lot of information to third parties! The way the camera system’s easy connect “P2P” works is that your recorder is already talking to one of LaView’s servers. If they can’t even be trusted with making a secure phone app how could you ever think of trusting them with authorization access to your cameras? After finding out this info I contacted my client to let him know their was an issue and that I would be replacing his camera system at no extra cost to him. After all I did sell him this system and make a premature recommendation on it! He then also informs me that the remote viewing hasn’t even worked for the past day. That may be a good thing given the issues with their mobile app! In short my recommendation is to avoid this brand. It is obvious that they can’t be trusted with data so how could you ever think of trusting them with your security cameras? I have been testing the replacement system from another company and will likely be writing a review for them in the near future after I have done more extensive testing.